The expansion of public infrastructure, establishment of new industries as well as growing number of hotels are anticipated to drive the diesel genset market in the country over the coming years. Further, development of the healthcare and hospitality sectors owing to an increase in the medical tourism in the country would generate demand for diesel gensets during the forecast period. According to 6Wresearch, Philippines diesel genset market size is projected to grow at a CAGR of 3.8% during 2018-24. Establishment of BPOs of several global companies is accelerating the growth of commercial activity in the region, resulting in high usage of diesel gensets in Philippines as a backup source of power. The growth of transportation infrastructure in Manila and Luzon islands of Philippines along with an increase in the energy demand. The commercial and industrial sectors accounts for the highest Philippines diesel genset market share and are expected to maintain its dominance in future. The growth in the tourism sector of the country is expected to aid the development in commercial sector as well, the latter of which is expected to receive heavy investment in near future. In addition, Philippines has more than 50 hotels under construction with opportunities of nearly 10,000 rooms around the country. This is expected to further contribute towards the growing demand for diesel gensets in the country. The Philippines diesel genset market report comprehensively covers Philippines diesel genset market by kVA rating, applications, verticals and regions. The Philippines diesel genset market outlook report provides an unbiased and detailed analysis of the Philippines diesel genset market trends, opportunities/high growth areas and market drivers which would help the stakeholders to decide and align their market strategies according to the current and future market dynamics. •	Historical Data of Philippines Diesel Genset Market Revenues & Volume for the Period, 2014-2017. Revenues & Volume, until 2024F. •	Historical Data of Philippines Diesel Genset Market Revenues & Volume, By kVA Ratings for the Period, 2014-2017. •	Market Size & Forecast of Philippines Diesel Genset Market Revenues & Volume, By kVA Ratings, until 2024F. •	Historical Data of Philippines Diesel Genset Market Revenues & Volume, By Application for the Period, 2014-2017. •	Market Size & Forecast of Philippines Diesel Genset Market Revenues & Volume, By Application, until 2024F. •	Historical Data of Philippines Diesel Genset Market Revenues & Volume, By Verticals for the Period, 2014-2017. •	Market Size & Forecast of Philippines Diesel Genset Market Revenues & Volume, By Verticals, until 2024F. •	Historical Data of Philippines Diesel Genset Market Revenues, By Regions for the Period, 2014-2017. 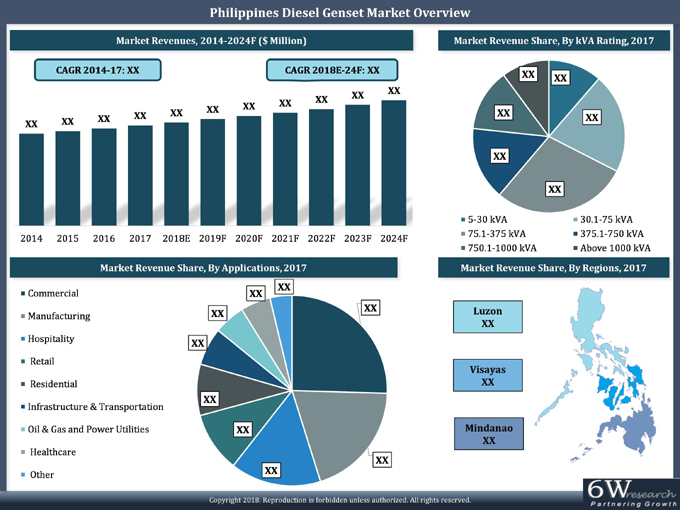 •	Market Size & Forecast of Philippines Diesel Genset Market Revenues, By Regions, until 2024F. 14.1 Mitsubishi Heavy Industries Engine System Asia Pte. Ltd.
14.3 FG Wilson Asia Pte Ltd.
14.6 Deutz Asia-pacific (Pte.) Ltd.
14.8 Denyo United Machinery Pte. Ltd.